HMSHost brought the excitement of live cooking competitions to an airport setting this week as it hosted the fifth annual Channel Your Inner Chef event at Chicago O’Hare International (ORD). 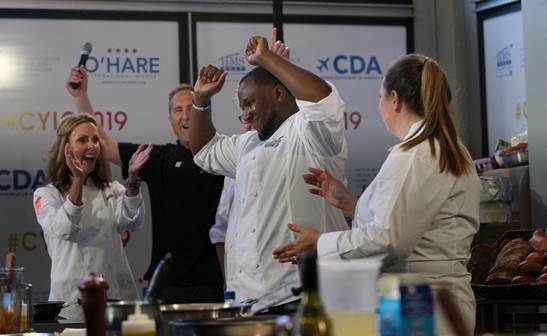 The event featured four chefs from around the country in a 30-minute culinary battle in front of passengers at one of the world’s busiest airports. The contestants used ingredients revealed only when the contest began and included items grown in the O’Hare Urban Garden in Terminal 3. The winning “Channel Your Inner Chef” dish, pan-seared chicken breast with a brown sugar glaze from DeAndre Smith, will be featured as a menu item at one of HMSHost’s ORD restaurants. “Channel Your Inner Chef is unique, not just as the original airport cook-off event, but in that it offers a platform for diverse chefs regardless of background to showcase their enthusiasm and culinary talent in front of a jet-setting audience,” says HMSHost President/CEO Steve Johnson.